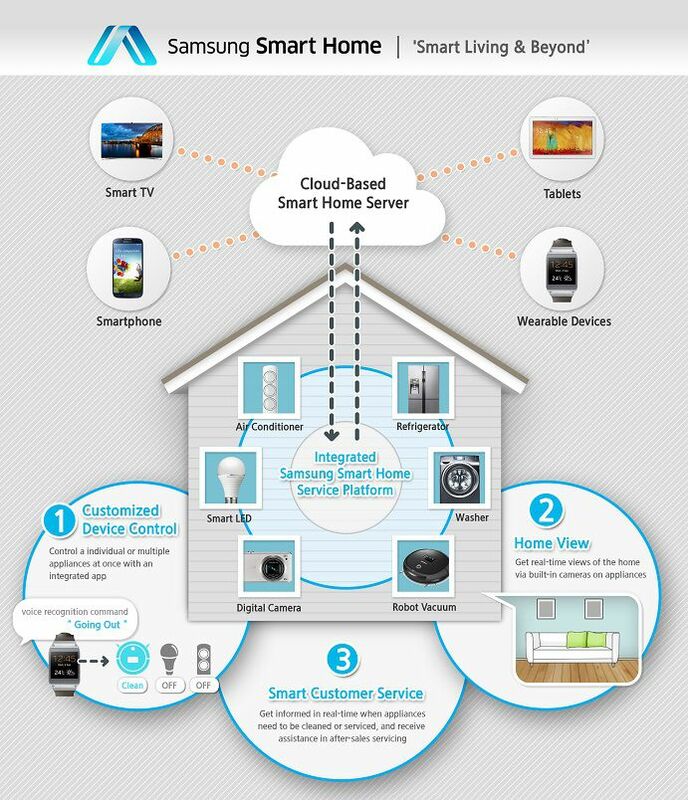 Samsung Electronics announced Samsung Smart Home, a service where all home devices such as Smart TVs, home appliances, Smartphone and Smartwatch connected and managed through a single integrated platform. The Samsung will unveil brand and logo at CES 2014 in Las Vegas and the service will be rolled out across Samsung devices and appliances in the first half of 2014. Samsung will also talk with third-party partners to make services available on various products. Samsung has developed Smart Home software protocol (SHP) to enable connectivity between all Smart Home products. Initially Samsung Smart Home will provide three main features: Device Control, Home View and Smart Customer Service. Users can use customized settings on their mobile devices or Smart TV to monitor or control other home devices such like turning on air condition or house lighting. No matter where are you, you can control it from inside or outside the home or even while travelling abroad. You can control multiple devices simultaneously with Smart Home app. Smart Home also offers voice command features to control devices. For e.g say ‘going out’ on your Smartwatch and Smart Home will turn off all home lighting and other appliances. Same feature will be available on Smart TV. Smart Home allow you to get a real-time view of the home via inbuilt appliance cameras on their Smartphone. This service notifies users when appliances need customer service. Samsung Smart Home will expand to cover home-energy, secure home access, healthcare, and Eco home applications through the partnerships with third-party service providers.